Hot Pepper Pizza is mom’s specialty! I really don’t understand how she can always make it with the same deliciousness. She is such a skillful cook! You can only hear us saying nomnomnom when munching on this tart like pizza, no other words! Mom knows how to make us happy in the morning! Even the smell filled in home is enough to wake us up! It has a cotton soft crust and the topping is to die for! I claim that no pizza makers have ever combined these ingredients to top a pizza! So what do we have on top of this hot pepper pizza? Right, it has hot pepper flakes as the name suggests and mom uses loads of onions and sesame seeds. I wanted to have my touch on it, so I added a little feta and rosemary. Mom says it becomes even tastier with these two additions! She uses a good amount of olive oil both in the topping and in the dough. It helps the dough to be super soft and the topping to be a little moist and irresistible! Finely chopped onions, sesame seeds, red bell pepper, hot pepper flakes or hot chili, pepper paste (just skip it if you can’t find; it tastes still so good! ), rosemary and olive oil are mixed with a spoon (mom always uses her hand for this) so that they combine very well. So you see that the method of preparing the topping for mom’s hot pepper pizza is quite different from regular pizza toppings. I want to leave the feta white, so I add them on the top separately. I don’t suggest using parchment paper to bake mom’s special hot pepper pizza. Oil the pan with your hand, transfer the dough into it and flatten it with your oily hand until it covers the bottom of the pan. 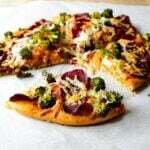 Believe me, olive oil is a must in this recipe as it makes this pizza soft and yummy! I love this hot pepper pizza warm, but you can definitely serve it cold too. It’s still soft and tasty, so it makes a perfect picnic or potluck food. You can keep these in an airtight container for about a week. Hot pepper pizza with super soft crust. Combine all ingredients for the dough very well. Cover and wait for an hour so that it rises. Meanwhile, prepare the topping in a bowl combining all ingredients very well except feta. Oil a square pan with 2 tbsp olive oil. Transfer the dough into the pan and flatten it with your hand when it’s still oily until it covers the bottom of the pan. Spread the topping mixture on it pressing with your hand. Add feta and press on it gently. Cut it into squares and bake 40 minutes. You can check its bottom to understand if it’s done. If the bottom is a little golden, it’s done. What size pan? Also, did your mother use whole wheat flour, or is that something new you decided to do?